This tab on the website is a record of my building a kit of the World War Two Japanese Navy Air Force Mitsubishi J2M3 Raiden (Thunderbolt), which was given the Allied code name "Jack" (to enable Allied military personnel to be able to remember and quickly identify the many different Japanese aircraft, Japanese fighter-planes were given Western male names [Oscar, Tony, Frank], and Japanese bombers were given Western female names [Betty, Peggy, Frances]). 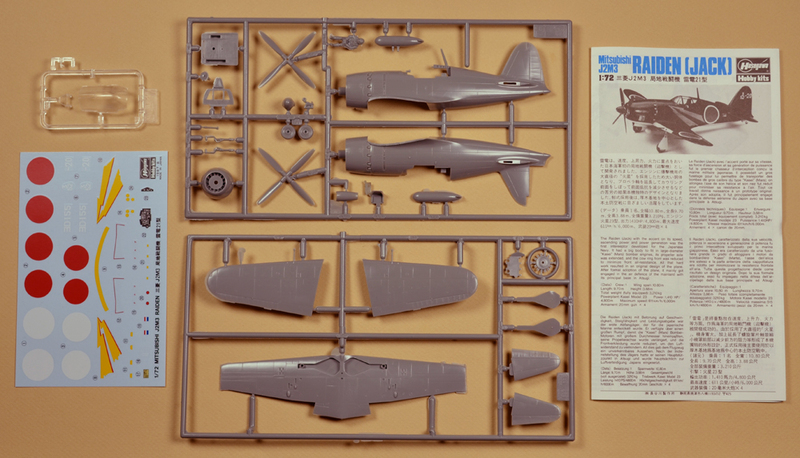 Here are all of the contents of the kit box: a runner with the transparent kit parts at the top left, decal sheet at the lower left, two runners containing the opaque kit parts in the middle, and the front of the instructions at the right. This is a pretty simple, straight-forward kit, with a date on the instructions and decals of 1987. The panel lines are engraved, and the wheel wells in the lower wing part are boxed in. 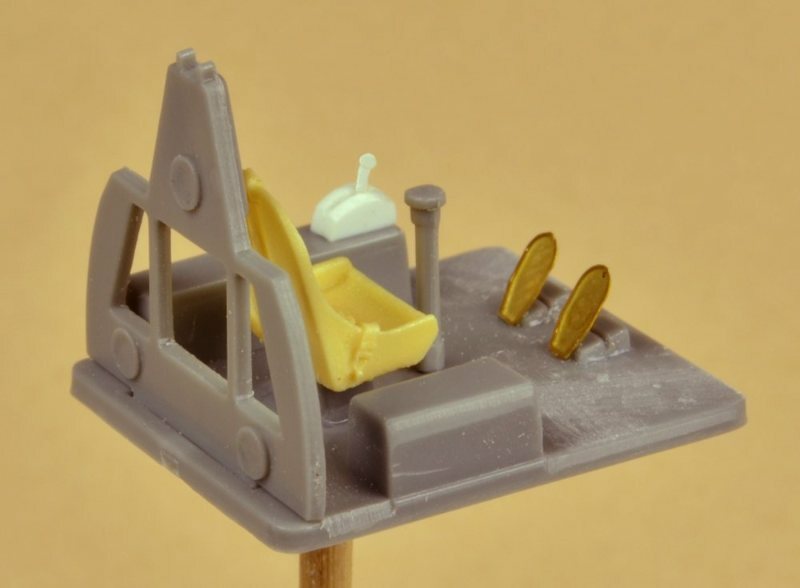 There is some flash (excess plastic that oozes into the tiny gap between the two mold halves, as the mold becomes worn with use) but that is not unexpected in a twenty-five-year-old model. All in all, a fine little kit. 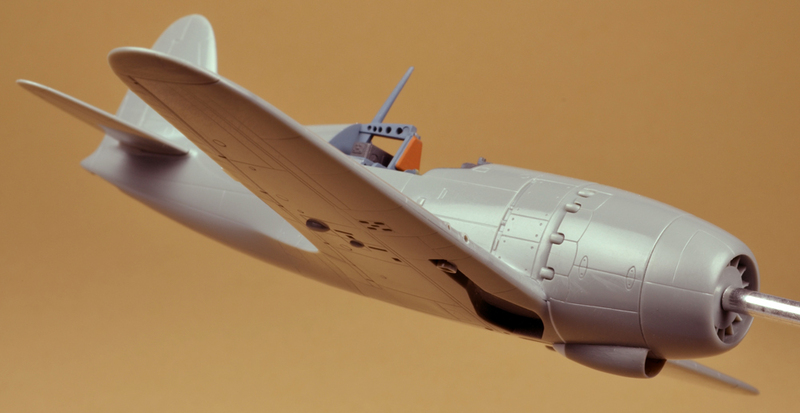 For the most part, World War Two fighter aircraft were designed to be simple (easy to build), lightweight (able to fly fast and maneuver with agility), and relatively inexpensive (a P-51 Mustang had a projected lifespan of 150 hours flying time or less). 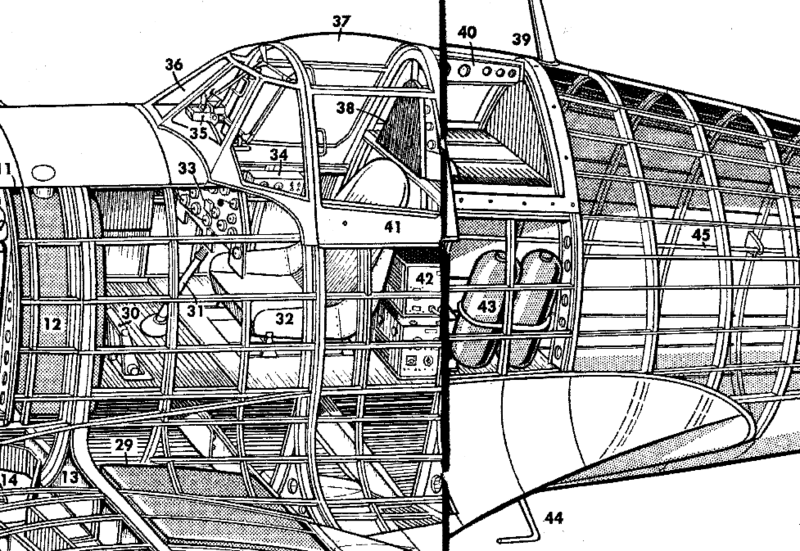 The fuselage of the real Jack had the typical underlying structure of curved fuselage formers (round or oval frames vertically oriented at right angles to the centerline of the fuselage) with longerons (horizontal strips stretching from front to rear) attached to the formers. On a kit from the 1980s, it was typical that this would not be represented in the model. 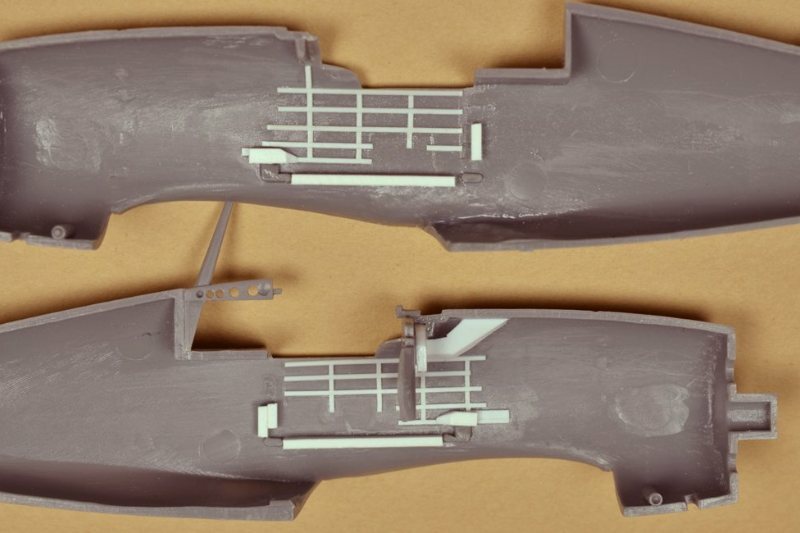 I added these formers and longerons (made from .010" x .020" Evergreen styrene strips) to the interior of the fuselage halves, but only where they can be seen through the transparent canopy, when the model is finished. I located these parts on the basis of a black and white cutaway drawing from an article on the Jack in a 1971 compilation volume of Air Enthusiast magazine. 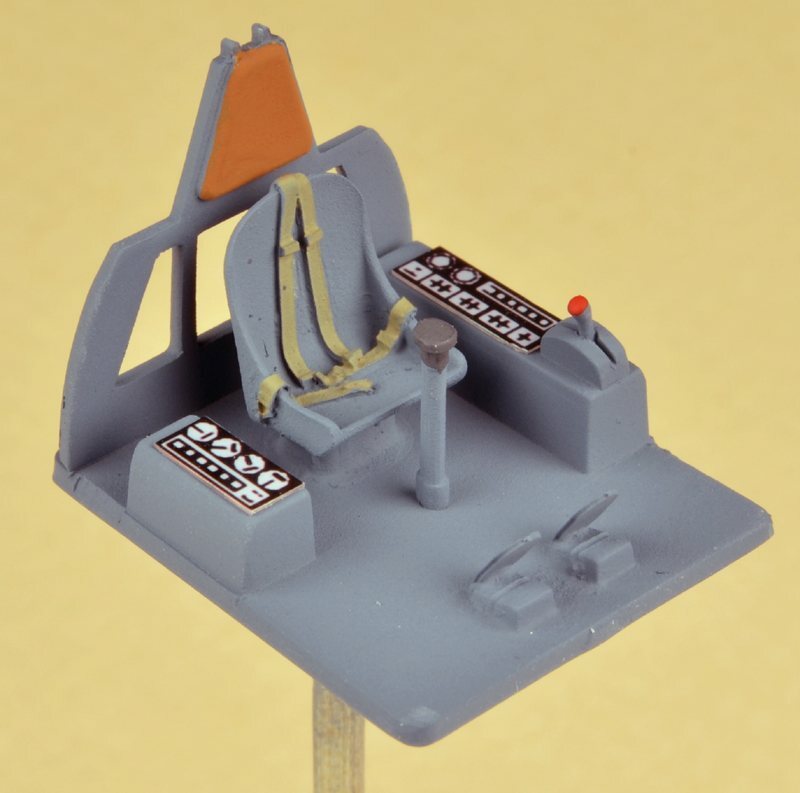 I also added bits of styrene at the supports for the cockpit floor assembly, and a brace to support the part that receives the decal for the instrument panel. 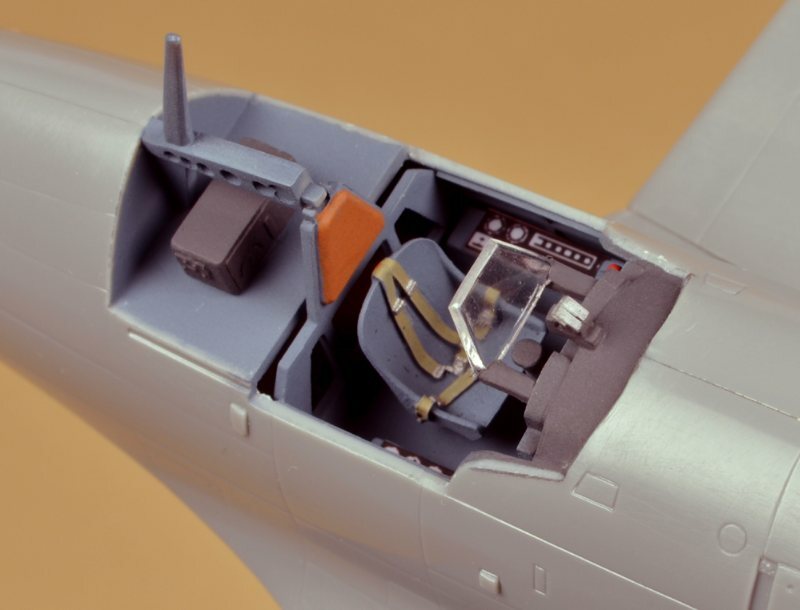 The resin seat is a generic World War Two fighter-plane part produced by the Squadron Shop as part of their "Tru-Details" product line. It includes the lap and shoulder harness straps. I made the throttle quadrant by exposing a tiny rod of .020" diameter Evergreen styrene to the heat of a lit match; this heat causes the end of the rod to melt and swell into a button-like tip, simulating the knob at the end of the pilot's throttle control. 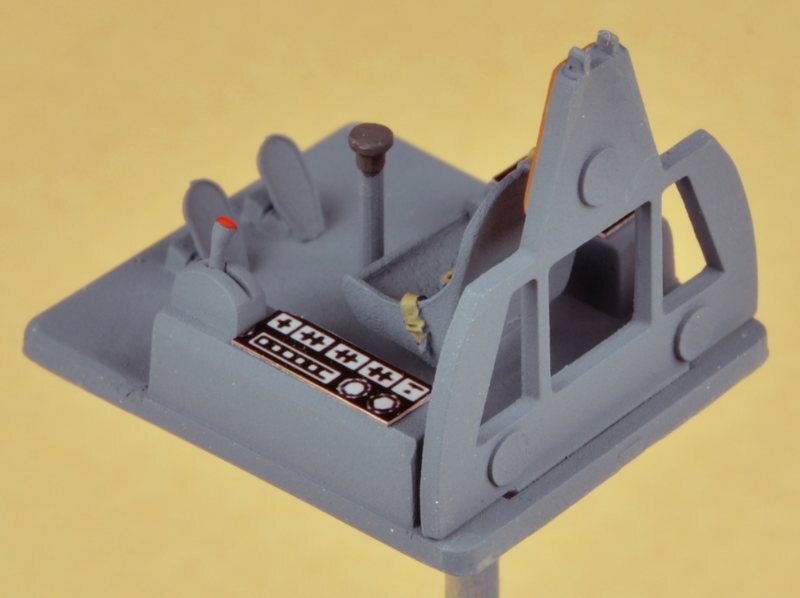 The rudder pedals are photo-etched brass, also from the Squadron Shop "Tru-Details" line. 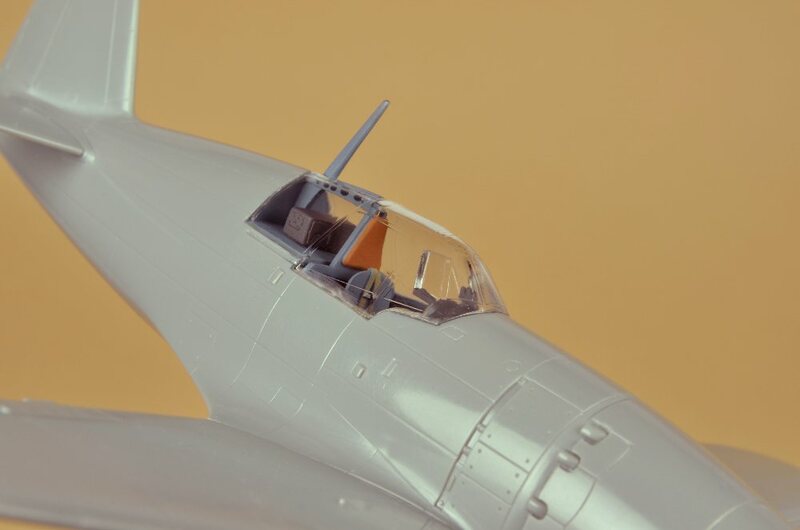 According to Donald W. Thorpe's reference book Japanese Naval Air Force Camouflage And Markings World War Two, the interiors of JNAF aircraft could be painted with any one of several particular shades of green, or with a translucent dark blue or translucent dark green. Based on the very limited color information I have on the Jack, I opted for Humbrol #144 Intermediate Blue, to approximate the translucent dark blue. The rectangular Evergreen tubing at right angles to the left fuselage half is the anchor for an aluminum tube to be installed later. This tube will provide a temporary handle for airbrushing and decaling the entire model. Once all painting is complete, the tube will be cut off, and form a bushing for the propeller shaft. It's a rule: all propellers must turn freely. Seriously. Before applying the instrument panel decals, I painted Johnson's "Future" acrylic floor wax over the Humbrol #144 Intermediate Blue paint, using a Testor's soft nylon paint brush. The flat finish of the Humbrol paint is a poor surface on which to expect the decals to adhere. The "Future" acrylic provides a clear, smooth, glossy finish, much better for getting decals to stick. Once the decals were dry, I added another coat of "Future", to seal the decals. To complete the cockpit floor assembly, I painted Humbrol #144 Intermediate Blue on all surfaces. Then I detailed the assembly by painting Humbrol #62 Matt Leather to the headrest, Humbrol #72 Matt Khaki Drill to the lap and shoulder harness, Humbrol #67 Matt Tank Grey to the handle of the control stick, and Humbrol #60 Matt Scarlet to the throttle knob. When all of the paint was dry, I cut out and installed the side consoles, from a sheet of generic instrument panels and consoles I created in AutoCAD. This AutoCAD art contains instrument panel designs spanning from the simple panels of the biplanes of the 1920s, through the cluttered analog displays of the jets of the 1970s, all in three slightly different sizes. A local computer graphics and display media shop called PhotoWorks took my AutoCAD art and computer-printed it on a sheet of white film, providing me with a lifetime supply of cockpit panels. 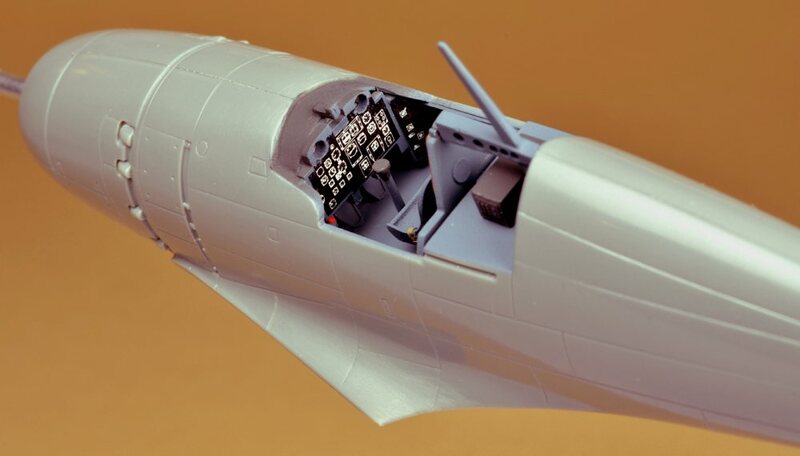 The more recent the design and manufacture of a kit, the more likely it will have decals, or raised details, or both, representing most of the controls in the cockpit. The older the kit, the less such detail. The Jack was new enough to have a decal for the instrument panel, but too old to have more than just the suggestion of the side consoles. This is where my homemade instrument and console film becomes useful. I accept that my generic instruments are not precisely accurate for any particular aircraft. It's enough for me to have a reasonable suggestion of appropriate dials and switches. When I started building plastic models in the 1960s, the only adhesives available were plastic model glues in two formats: a thick, clear glue in a metal tube (like a tube of ointment), and a very runny, clear liquid glue in a bottle, with an applicator brush attached to the bottle cap (like a bottle of fingernail polish). The thick tube glue was hard to control and messy, got on my fingers and then smeared on the model's exterior. I learned to use it mostly where I needed strong joints, like attaching the wing to the fuselage. I learned to use the thin glue to attach small parts, where precision and control was essential, by using a very small paint brush, instead of the big applicator brush in the bottle cap. However, these solvent-based glues had a side effect. For the last thirty years, to assemble the main parts of a plastic model, I use fast-acting cyanoacrylate ("super glue"). This takes practice, and lots of care, to not glue the model parts to my fingers. Once cyanoacrylate model glues became available, I quickly made the switch, because the plastic glues worked by using solvents to liquify the plastic, welding the two parts together. However, over time, the seam between the two parts joined by the solvent glue would often sag, because the solvent continued to dissolve the plastic. This sagging joint would telegraph under the paint on the finished model, sometimes years later. Very discouraging. Cyanoacrylate glues work by gripping the microscopic texture of the gluing surfaces, forming a mechanical bond between the two parts. No dissolving of the plastic takes place, so once I have filed, sanded and polished a seam, the seam never sags, even years later. I still use the runny liquid to cement small parts, where there is no concern about sagging joints. The liquid plastic cement also has the advantage of allowing adjustment to the alignment of the joined parts, for up to twenty or thirty seconds; the "instant" cyanoacrylates have no working time- the bond is truly instant. If I need to make a bond between large parts, with a little bit of working time (five seconds or less), I use the thick ("slow") cyanoacrylate glue. 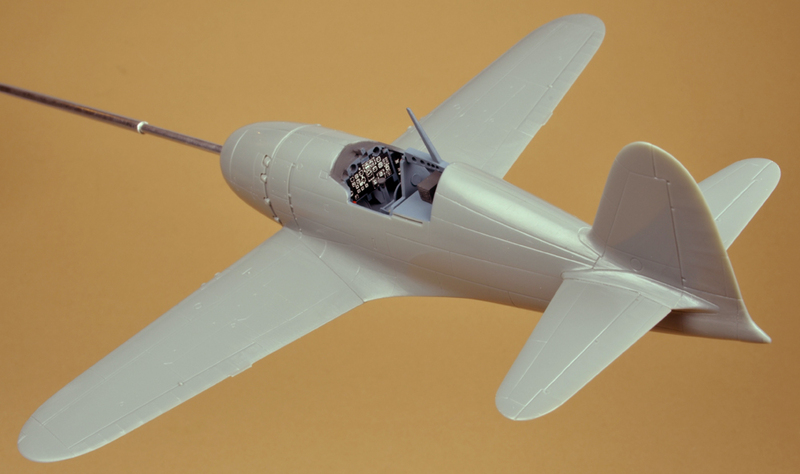 Adding the wings and horizontal stabilizers to the fuselage is a very important step in assembling an aircraft model. The trick is to make sure these parts are as perfectly symmetrical as possible. Sighting down the fuselage, the left wing should angle up (dihedral) or down (anhedral) in relation to the fuselage, to the exact same degree as the right wing. Similarly, the angle of the left horizontal stabilizer should exactly match the right. And the vertical stabilizer (fin and rudder) should be perfectly vertical, in relation to the fuselage, the wings and the horizontal stabilizers. There are a couple of techniques to achieve this. The time consuming way is to build a jig, as I did for the Junkers J.1 (see the tab labeled "Prop Planes"). I usually only build jigs for biplanes, because there are two wings to get aligned properly. For monoplanes, like the Jack, I rely on a simple tool I create from a scrap of cardboard: I draw, as exactly as possible, a horizontal line, bisected at 90 degrees (I use a drafting triangle) by a vertical line. Where the lines cross, I drill a hole the size of the aluminum tube for the model handle/propellor bushing. 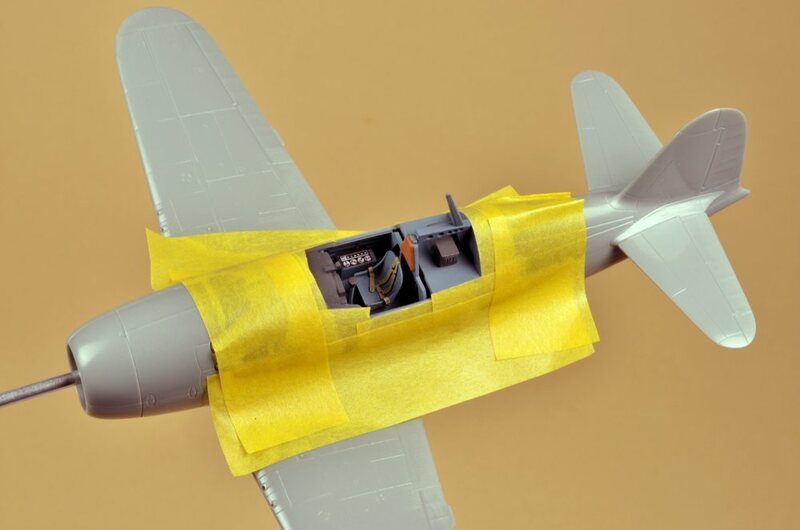 I insert the aluminum tube in the hole, and adjust the fit of the wings and horizontal stabilizers to align symmetrically with the perpendicular lines on the cardboard, before I apply the glue. This step is particularly important for me, because the eyeglasses I wear correct for an astigmatism in one eye, and distort my view of reality, slightly. If I depended on my glasses-corrected vision to show me what is plumb and true, I'd end up with crooked models. The jigs keep me honest. 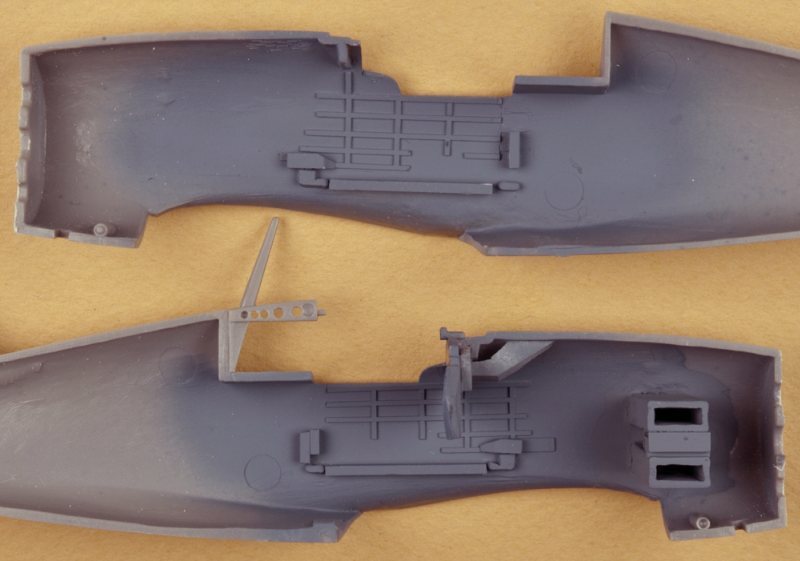 The fit of the wings to the fuselage on this Hasegawa kit was quite good, except that, as manufactured, the wings installed about 1/32" too far forward. When I forced the wing aft, the wedge shape of the joint between the tops of the wings and the fillet at the fuselage spread the wings apart slightly, forcing the dihedral of the wings to diminish. To get around this problem, I carefully filed away at the fuselage fillets, to make enough room for the wing tops to fit, without reducing the dihedral. 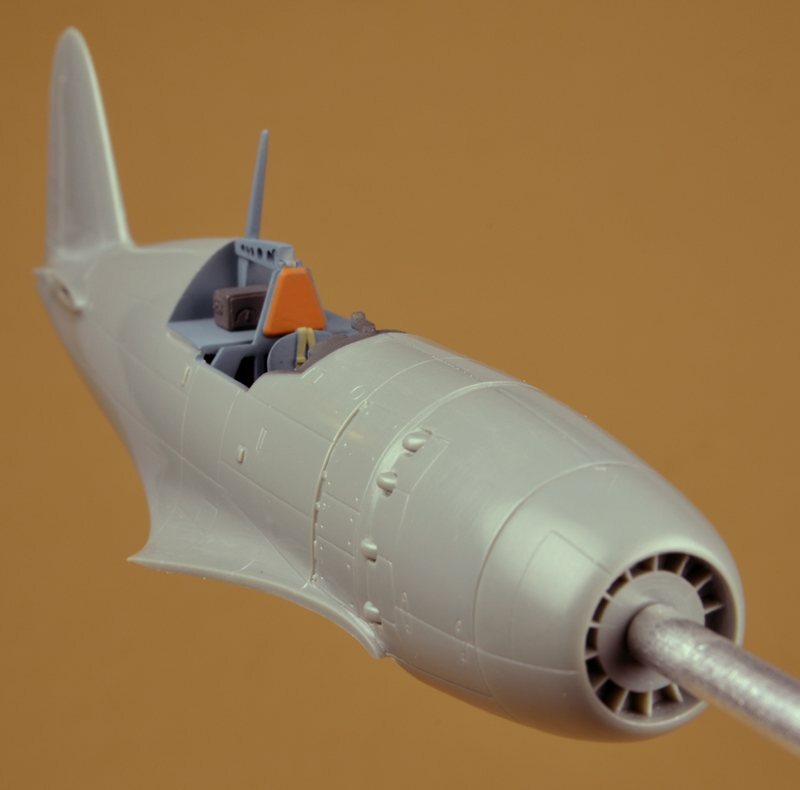 Then, I could add a spacer of Evergreen plastic to the fuselage opening, where the bottom of the wing fit. In this way, the wings fit the fuselage neatly, without losing any dihedral. As I work on this website tab, seeing the photos after I upload them points out areas on the model that still need work. After consulting my reference books, the photo above shows me that I need to fill a couple of joints where the model Jack has seams that the real Jack does not: through the flaps, where they meet the fuselage, and at the vee-shaped seam between the center of the wing bottom and the fuselage. In the picture above, you can see a small, conical fairing in Evergreen styrene, at the back of the oil cooler intake, under the engine cowling. This conical shape was part of the lower wing, which I deliberately sacrificed, when I cleaned up the joint between the lower wing and my spacer at the fuselage. I knew I could add a plug of Evergreen bar stock to the rear of the oil cooler intake part, whittle it down, and then file, sand and polish it to blend with the intake part. You can also see where I re-scribed the engraved panel lines (across the underside of the fuselage) that were at risk of disappearing when I sanded and polished away the seam between the fuselage halves. One trick to preserving these faint, engraved panel lines is to align the fuselage halves as carefully as possible as you glue them with the cyanoacrylate, to minimize the amount of filing and sanding, in the first place. Another trick is to slightly deepen the engraved panel lines with a dedicated plastic model scribing tool, prior to sanding the seam. The deeper grooves become more shallow, but still visible, as plastic is abraded away by the file and sandpaper. As a last step, I carefully clean out each panel line with the scriber, one last time, to remove any plastic dust that sticks in the groove. 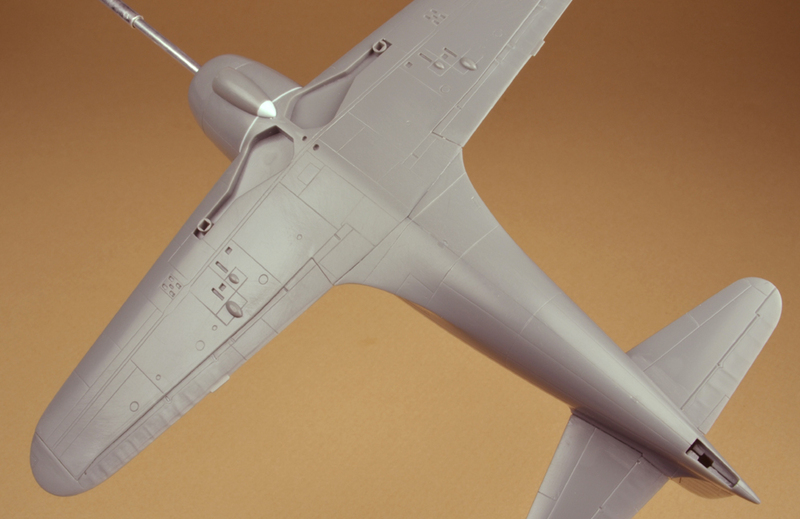 Wing framing detail added to wheel wells; joints filled and flaps rescribed. Here I have filled the joints between the lower wing and the bottom of the fuselage with superglue and filed the seams smooth. (You will be able to see this better, once some paint is applied.) Then I rescribed the lines of the flaps. Next, I noticed that the wheel wells looked pretty bare, so I added the suggestion of wing ribs and wheel well stiffeners to the wells, referring again to my Air Enthusiast cutaway drawing. 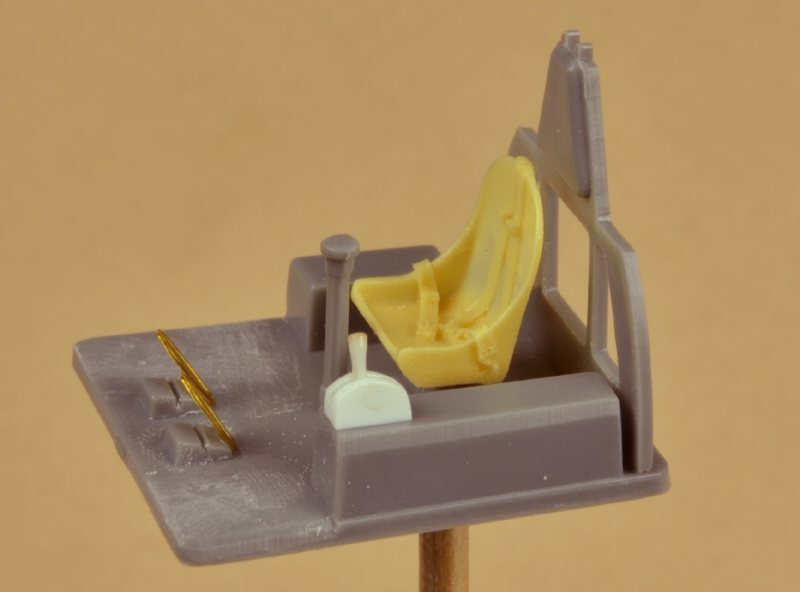 If a kit of a 1/72 scale aircraft is sophisticated enough to have closed-off wheel wells in the first place, often times these wheel wells will not be to a scale depth, I believe because of limitations in the nature of the molds and the flow of styrene into the mold cavities. (This can be checked by trying to fit the landing gear strut, wheel, and wheel doors all down into the wheel well cavity: most of the time, they don't fit.) The wheel wells on the Jack were just such a situation. I opted not to spend any of my limited model building time on reworking these wheel wells; in fact, adding the rib detail actually made the situation worse. But the end result will create enough of an illusion of a proper wheel well, that I will be content, and have time to devote to building some other model. Everything in life is some kind of tradeoff, of efforts versus results, and learning to recognize the point of diminishing returns is a real timesaver. I masked off the cockpit once more and airbrushed Testor's Flat Lacquer, to dull the sheen of the Hasegawa instrument panel decal and my homemade side console panel films. 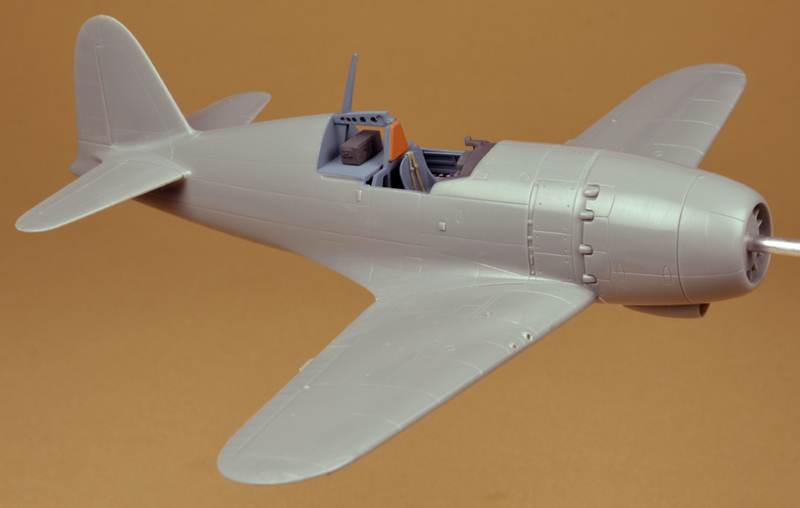 This flat coat also smooths out the matt finish of the raw paints in the cockpit. I use Tamiya masking tape, the best masking material I have ever found: it is thin, strong, and flexible (once cut into very thin strips), and masks very cleanly (leaves very sharp, crisp demarcations between paints) The adhesive is very sticky, but won't peel up paint, doesn't leave adhesive residue behind when I remove it, and doesn't dry out and become brittle, even after days or weeks on the model. It also doesn't age, inside the drawer of my hobby storage unit. I've learned it's worthwhile to mask any bare plastic, adjacent to where I need to airbrush some paint, so that as much as humanly possible, the entire surface of the plastic model receives only one layer of paint. The Humbrol paint seems to airbrush the most smoothly over bare plastic. Subsequent layers of Humbrol, one on top of the other, don't airbrush on as smoothly, and require a heavier, wetter coat, to dry with a smooth finish. Where there has to be hard-edged masking, the thick layers of Humbrol can result in a noticeable, shadow-casting step between colors. If you could see my Heller AJ-37 Viggen in person, you would be able to see this outcome. On soft-edged camouflage schemes, by the nature of the free-hand airbrushing, this outcome is not nearly as noticeable. Added armor glass and reflector gunsight parts. Before gluing on the canopy, I installed the kit parts that represent the thick piece of armor glass, and the reflector gunsight. 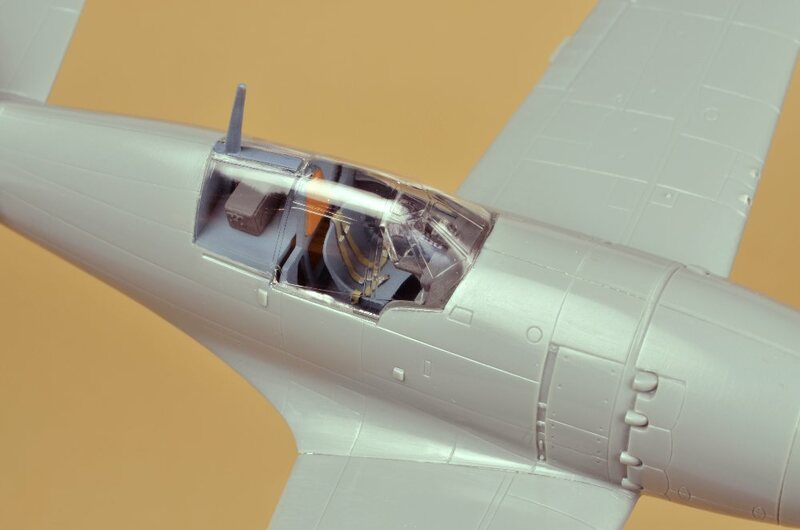 On World War Two fighter aircraft, armor glass was provided to give some protection to the pilot, in head-on attacks against other fighters, or from the defensive guns of bombers. Sometimes, in the RAF Spitfire for example, this armor glass formed the front of the windscreen, taking the place of the usual plexiglass. 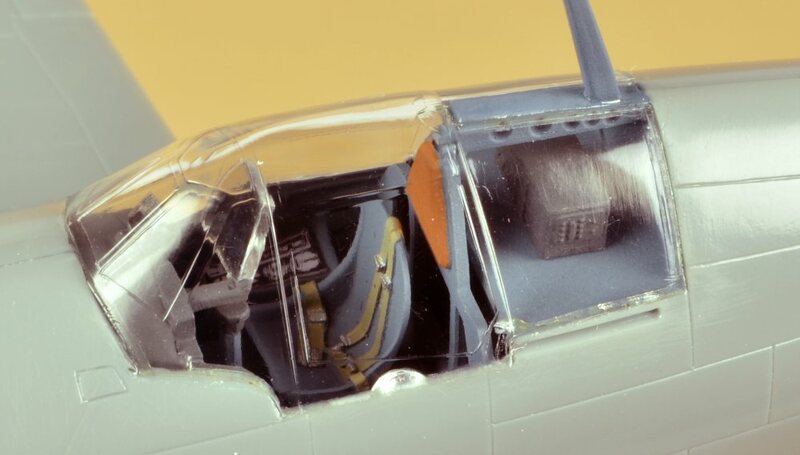 In the Jack, the armor was installed as a separate piece, inside the canopy, because the front, flat panel of the Jack's windscreen was so tiny. A reflector gunsight was an illuminated device that projected an aiming point out to infinity, often through a slanted piece of glass, mounted on the top of the instrument panel coaming. This was a great improvement in fighter gunsights, over earlier, simple ring and bead sights. 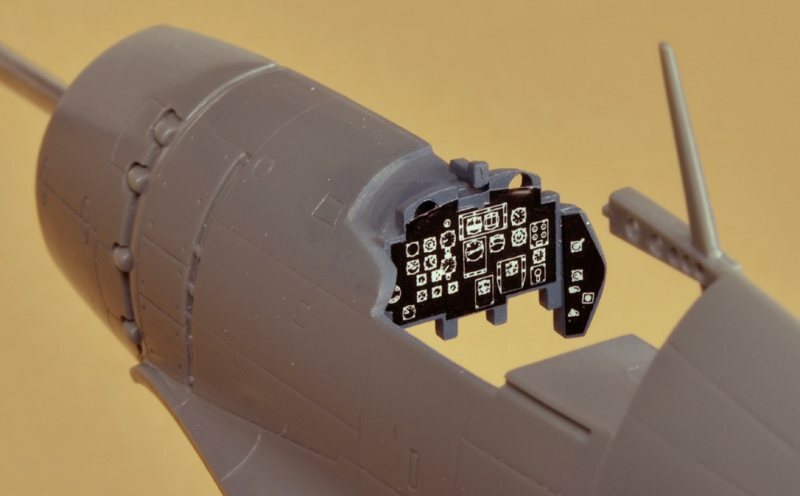 I don't understand any more than that about this device, but if you are interested in the Wikipedia entry on "Reflector gunsights", CLICK HERE This Hasegawa kit included a tiny part representing the reflector gunsight, on the canopy runner, along with the armor glass part. I painted the non-transparent areas of these two parts to match the cockpit color scheme. Installing the transparencies on a plastic model can be tricky. 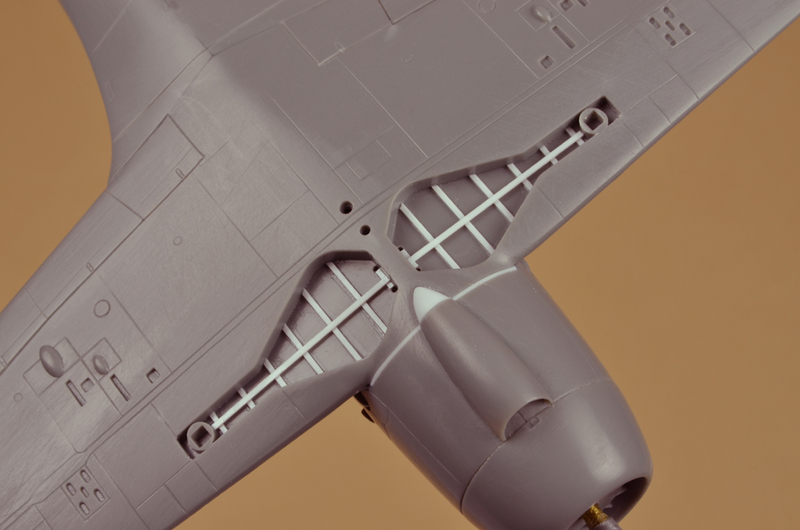 The clear styrene used in plastic kits is easily scratched, easily cracked when removed from the runner, and is much more brittle than opaque styrene. 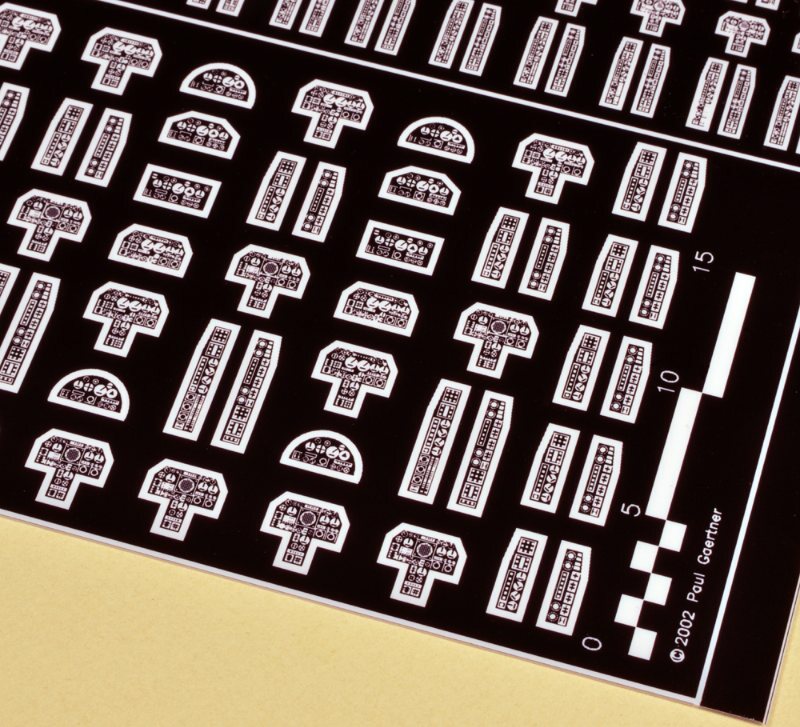 Transparencies must be handled very carefully, and installed equally carefully, using special adhesives and techniques. I remove a transparency from the runner by using a very tiny, very fine-toothed saw blade, made by the photo-etching process, installed in an X-acto handle. I saw the transparency away from the runner, deliberately leaving a 40 thou (.040") stub of sprue on the transparency. Then, using a brand new, unused X-acto blade, I carefully slice tiny slivers of the sprue away from the transparency. Making these tiny shavings avoids placing any serious stress on the clear part, which avoids the risk of cracks appearing in the transparency. I wear a pair of maximum magnification, over-the-counter reading glasses, to see the work as closely as possible. The last, ultra-thin slice of sprue is as flush with the surface of the transparency as my highly-magnified vision will permit. I try to avoid the need to sand or file the location where the sprue joined the transparency, for a couple of reasons: first, why bring highly abrasive objects anywhere near the fragile clear plastic? And second, holding the typical, generally half-tubular canopy piece in my fingers, to sand or file upon, can introduce stresses on the part, which can show up as tiny, light-catching stress fractures in the canopy. Once the canopy for the Jack was removed from the runner and cleaned up, I checked the fit on the fuselage. In typical Hasegawa fashion, the fit was very good. During handling, despite my best efforts, some tiny scratches were developed on the canopy, particularly on the interior. I applied Johnson's "Future" clear acrylic floor wax to the interior only, with a very clean nylon paint brush (reserved only for this one task). The "Future" filled in the tiny scratches, flowed out to an incredibly smooth, shiny surface, and provided a crucial barrier on the plastic from the glue fumes in the next step. When the fuselage was ready to have the canopy installed, I fit the canopy in place, and applied very tiny amounts of Testor's liquid plastic cement to the joint between the canopy and the fuselage. I use a very small, fine paint brush, so there can never be too much Testor's flowing into the joint. This is critical, because the fumes from the highly evaporative solvent in the Testor's glue can fog styrene plastic, particularly clear styrene. (Oh, the bitter experiences by which I learned this.) The "Future" forms a protective coating on the styrene, preventing any fumes from reaching the interior surface of the canopy plastic. The goal is to just tack the canopy into position. The next step will reinforce this relatively weak glue joint. 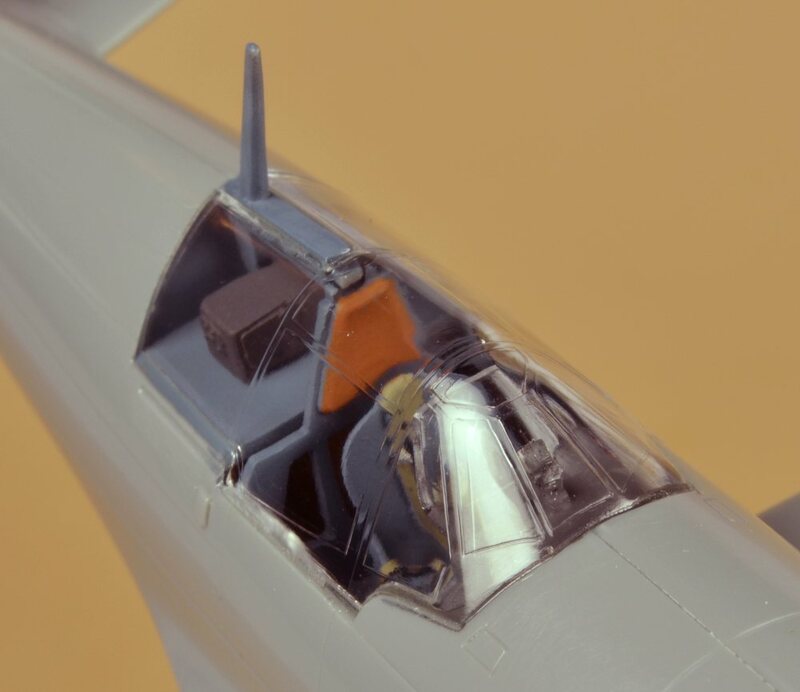 On most aircraft with canopies, the metal framing for the canopy glazing, particularly for the fixed windshield, is carefully blended into the skin of the fuselage, to maximize the aerodynamic flow of air over the canopy. 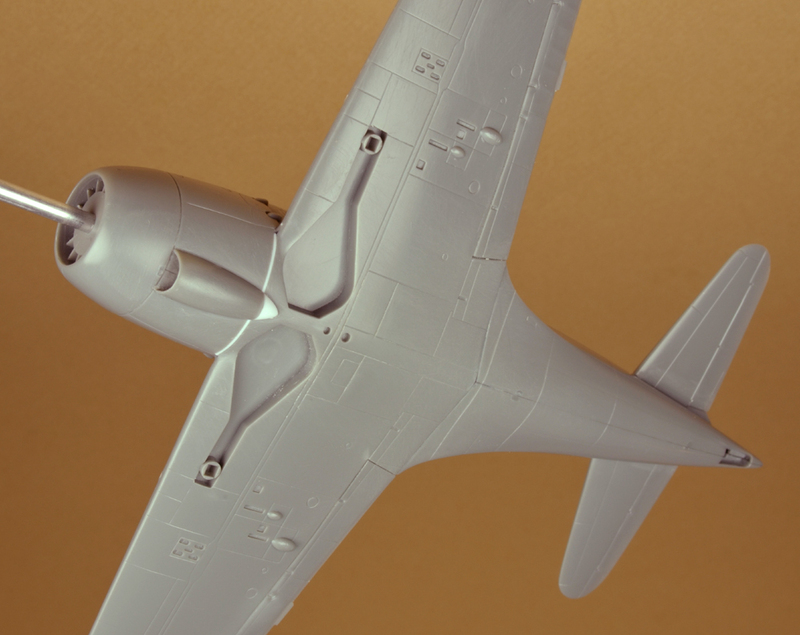 On plastic model kits, the joint between the fuselage parts and the clear canopy parts can range from seamless to gaping. Long ago, I learned how to improve this joint, using two-part epoxy glue. Epoxy has a few advantages that assist in this task: First, epoxy has no solvents that will attack styrene plastic. Second, depending on which curing duration epoxy is selected, epoxy has a "pot life", or working time, where it remains relatively fluid. I use thirty-minute epoxy for canopy fairing. Last, while it is curing, epoxy can be cleaned off of any non-porous surface with denatured alcohol. Once the Testor's tack bond had set on the Jack's canopy (about a half hour), I mixed some thirty-minute two-part epoxy on a scrap of aluminum foil. The consistency of the well-mixed epoxy was about as thick as honey. Using a round toothpick, I applied very small amounts of the epoxy to the joint between the canopy and fuselage. This joint for the most part was quite tight, but I was very careful not to force too much epoxy into any minor gaps between the parts. 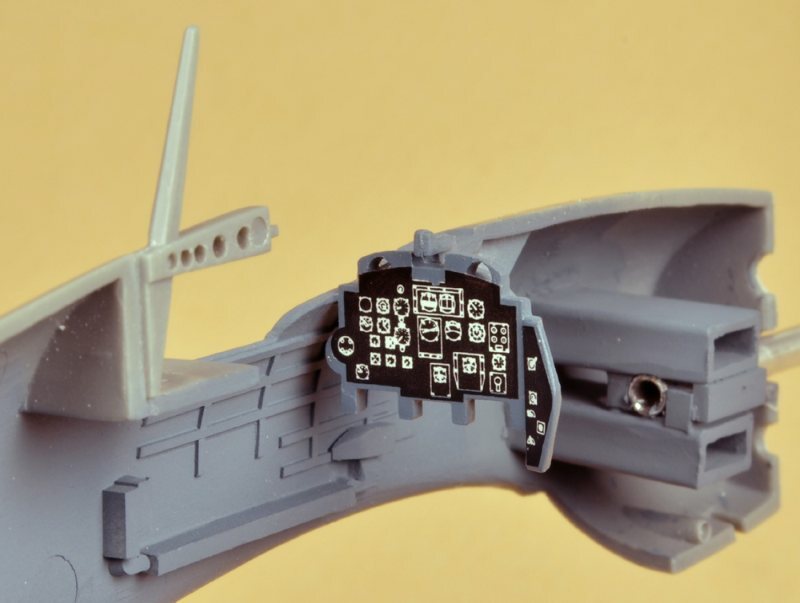 While it is still workable, epoxy is happy to ooze into any cavity, to the point where it becomes visible inside the cockpit (more personal experience talking, here). As soon as I had filled all of the joint between the two parts with the epoxy, I folded a small piece of paper towel into a little, stiff pad, with an edge and a crisp corner, and wet the edge of the pad with 91% denatured alcohol. Working very slowly and carefully, using either the edge or the corner as needed, I wiped away any excess epoxy from the surfaces of the fuselage/canopy joint, leaving a fillet of epoxy to bridge any gaps between the pieces. Once again, I was careful not to force the still-fluid epoxy too deeply into the cockpit. Thirty-minute epoxy usually remains workable long enough to be smoothed and filleted over most single seat aircraft canopies. If necessary, on large canopies, I do one side at a time. After 24 hours, the epoxy is completely cured. It can be sanded, if necessary (not this particular time) and painted. Since it does not dissolve the styrene, the joint will not telegraph its presence over time. It forms a strong, final bond between the two parts of the model, supplementing the Testor's tack bond.